The BMW 525i is not just a car to fill the gaps in an extensive line up of engine choices. The BMW 5 series is the benchmark for medium sized sedans and wagons the world over. Beautiful German engineering at its finest, handling at its best, and engines that purr in response to the pressure applied on the throttle. The BMW 525i is truly a pleasure to drive both around town and on the open road where its fine handling prowess can be experienced first hand. Solidly built and weighing a hefty 2 tonnes, the BMW 525i is superbly safe and comes in either 4 door or 5 door options. The BMW 525i M comes with the motorsport suspension and other sporty exterior additions such as the motorsport aerodynamic kit and alloy wheels. 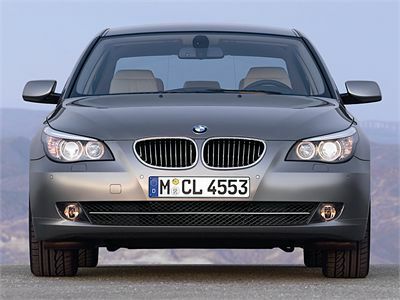 The BMW 525i SE is the more luxuriously equipped model. The BMW 525i SE sits solidly on 225/50 R17 tyres. The suspension is set up to hold this refined road cruiser tightly in place, giving confident handling even when pushed hard in cornering for the extra enjoyment factor. The kids in the back will have three point pretensioning seat belts that will securely hold them in place in the event of an accident. An advanced head protection system and child locks are standard. And a special first aid kit and safety triangle are on hand-if needed. In the front, there are well engineered airbags that are impact dependent. But enough of the melancholy. What’s under the aerodynamic and sleek bonnet of Germany’s finest? The BMW 525i is a 2996 cc in line 6-cylinder powerhouse that can unleash 160 kW of power at 6100 rpm whilst having 270 Nm of torque on tap at 2400 rpm. This all, in real people’s language, can thrust the vehicle to 100 km/h in around the 7 second mark (manufacturer’s figures) and onto a top speed of over 245 km/h, which, in my book, is quite remarkable for a 2.5 litre motor that needs to shove a mass of 2 tonnes against the forces of nature. Comfort levels remain high and, truly, to travel in the cabin is sumptuous, to say the least, even with the base cloth seats. Dakota leather and even the exclusive Nappa leather options are available to those who can afford the extra cash. The voluptuous Nappa leather seats come in two colours – tobacco or black. The BMW 525i is, of course, a driver’s car – even though the engine size is one of the smaller engines that is offered in the BMW 5 series line up. This is to the owner’s advantage because the BMW 525i is capable of a combined (city and open road) fuel efficiency figure of 38.2 miles per gallon. This is quite something, when you think about it. Amongst all the superb bells and whistles in the BMW 525i, there is a handy aid that will assist the driver when needing to make a hill start. This is a very practical item that many will thank the manufacturers for dreaming up. So, sit back and enjoy. Let the BMW 525i impress. Disappointment will be packed up and shipped far, far away. For any more information on the BMW 525i, or for that matter any other new car, contact one of our friendly consultants on 1300 303 181. If you’d like some fleet discount pricing (yes even for private buyers! ), we can submit vehicle quote requests out to our national network of BMW dealers and come back with pricing within 24 hours. Private Fleet – car buying made easy!